In the commercial domain professional photographers still actively pursue a good printing house. The wedding industry e.g., thrives on great quality prints. You cannot ignore the importance of great quality prints even in 2018. While all-in-one printers do produce respectable quality prints, they are not the best when it comes to producing magazine quality / professional quality. Plus, the media size is limited to A4 sheets. Further, inkjet printers use drops of ink to produce an image. The tonal graduations are not always very convincing; and this looks particularly pal when compared to prints obtained from professional printers. Plus, there is the question of large prints. What if you need a larger than A4 print? What if you want to have a full-fledged professional printing solution right in your studio? What if you want to print really big, something like 17″ and even more? For all of these needs, a professional quality printer is what you need. We list here a range of printers, right from the large format multi-ink solutions right down to desktop versions. But all of these printers have something in common. They are not your average all-in-one document / photo / scan and copy printers. They are designed for photo printing as the primary purpose. The Epson SureColor P20000 pushes the P10000 (which is a 44″ large format printer). The SureColor P20000 prints at a maximum size of 64″. The printer uses high performance 9-color archival standard pigments. The printhead on the SureColor P20000 has a total of 8000 nozzles over the ten color channels. It is capable of producing four levels of gray for the purpose of smooth tonal graduations and suppressed grain for brilliant archival quality prints. The ink tanks have a large 700 ml capacity for extended print work. The printer uses a smart ink management system to extend the usability of the individual ink tanks for lower printing cost. Internal memory of the printer is 320 GB which ensures a smoother print run over a network connection. 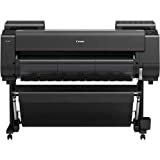 The Epson SureColor P2000 64″ currently retails at $8,995 on B&H. 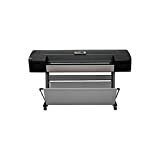 This little monster is one of the best large format photo printers around and can print a maximum width of 44″. The Canon imageProGRAF Pro 4000 comes with the L-COA PRO High Speed processing engine and uses 12 LUCIA Pro pigment based inks along with a Chroma optimizer. The printer uses a sub-ink tank system which ensures maximization of the printer ink utilization. It also has comes with the option to slot in large capacity cartridges for extended print runs. Additionally, you can change cartridges in the middle of a printing job without any issues at all. 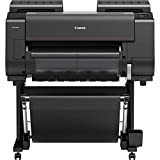 The printer uses a high precision mechanical platform which negates the need to switch when changing from matte black to photo black or vice versa inks. The printer comes with an integrated color densitometer with a three-color LED and a condenser lens. This allows the printer to be recalibrated whenever required. The Epson SureColor P8000 is a large format inkjet printer capable of printing at a maximum size of 44″. The printer can handle both cut media as well as roll media up to this maximum width. Roll media with up to 2 and 3″ cores are also supported. The printer is capable of printing at a maximum resolution of 2880 x 1440 DPI. The system uses 9 UltraChrome HD ink set and uses the Auto-switching black ink technology for producing high quality, deep black. It can churn out a 16 x 20″ print in as little as 2 minutes and 2 seconds flat. Just like the P6000 above, the P8000 also uses the same PrecisionDot technology which uses an advanced mathematical formula to auto calculate the dot size as well as the placement using the variable sized droplet mechanism for smoother print quality. Surely one of the best professional photo printers you can buy! The maximum printing resolution of the HP DesignJet Z3200ps is 2400 x 1200 DPI and the maximum printable width is 44″. The speed of printing a 22 x 34″ media is 120 seconds flat. The printer is powered by HP Thermal inkjet technology. It uses 12 pigment based photo inks with gloss enhancer for superior quality results which you can straight away hang in a gallery. Covering almost 96% of the PANTONE palette because of the chromatic red ink the colors are rich and vibrant. There is also an embedded spectrophotometer that allows you to create dedicated ICC profiles whenever needed. Additionally, HP’s proprietary Quad-Black Ink technology ensures that your monochrome images with smooth tonal gradations are reproduced perfectly in a print. The printer also comes with the professional PANTONE color emulation as well as native Adobe PostScript and PDF support. The maximum resolution the Epson SureColor P6000 can print is 2880 x 1440 DPI. It can print on a maximum printable width of 24″. The printer uses 9 Ultrachrome HD ink set. It uses the Auto-switch black ink technology. A color print by the printer will last for 200 years while a black and white print will last for nearly 400 years when archived properly. The system uses a PrecisionDot technology that uses advanced mathematical calculations to determine the perfect dot size using the built-in variable sized droplet mechanism. The printer comes with an optional 320 GB print server and SpectroProofer spectrophotometer for easy color calibration and verification of the proof before actual print runs. The 24″ Canon imagePROGRAF PRO-2000 can print at a maximum resolution of 2400 x 1200 DPI. The maximum print width is 24″. The printer comes with the FINE Print Head Technology and the L-COA Pro high speed processing engine. It also comes with a Color Densitometer for calibration. The printer uses a 1.28″ wide 12-channel print head which uses a 12-color LUCIA PRO pigmented ink along with Chroma optimizer. The Sub-ink tank mechanism ensures that there is no wastage of ink and the printer is able to maximize the number of prints per ink tank. There is no switching requirement when working with matte black and then with photo black and vice versa ink requirements. Additionally, the printer uses a three-color LED and condenser lens to ensure that the printer produces fine results no matter what the printing requirements are. The system comes with a 320 GB hard disk for smoother handling of print jobs and easing the workload on your computer network / system. The Epson SureColor P7000 Standard Edition is a 24″ large format inkjet printer with a total of 10 ink cartridges (UltraChrome HDX). The 10 color pigment based ink tanks ensure a much larger color gamut than is possible compared to traditional printers with 3, or more ink tanks. The print lifetime of photos printed with this ink is 200 years (for color prints) and 400 years (for the black and white prints). It has one of the highest resolution print quality in the business with 2880 x 1440 DPI with the individual ink droplets around 3.5 pl producing results where pixilation would be impossible to be detected. The printer supports a maximum printing media width of 24″. It can produce a 16 x 20″ photo in about 2:02 minutes. Plus, it supports roll media with 2″ and 3″ cores. 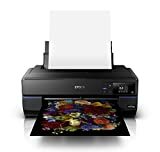 The Epson SureColor P7000 currently retails at $2,600 on B&H. The Canon ImagePrograf Pro – 1000 is a small yet powerful photographic printer designed for the discerning photographer looking for something extra other than what we are used to all in one multifunctional units. The Canon ImagePrograf Pro – 1000 comes with 12 LUCIA Pro pigment based inks. The ink tanks hold about 80 ml of ink each. It has two black (Photo Black and Matte Black) and one Grey (Photo Grey) along with an array of other colors for smoother gradations and deeper results. The printer is capable of printing at a maximum resolution of 2400 x 1200 DPI. Maximum print size is 17 x 22″ (Sheet Media) and it can print that size in a time frame of 4 mins and 10 seconds. It can also print borderless prints of that size. This professional photo printer Compatible with Canon PRINT app and PIXMA Cloud Link. The Epson SureColor P800 (also referred to as the SC P-800) is an inkjet printer that can print at a maximum resolution of 2880 x 1440 DPI. The maximum print size possible with the Epson SureColor P800 is 17 x 22″ using sheet media. Borderless printing is possible with a media size of 17″ (wide roll media). The printer has 9 UltraChrome HD pigment based ink tanks. The printer has what is termed as Automatic Black Ink switching. This technology allows for the black ink type to be switched from matte to photo black ink when different types of media are loaded. It supports Wi-Fi direct, Apple AirPrint and Google Cloud Print Support. In many ways a dye-sublimation / thermal printer produces more uniform color tones than is possible with an inkjet printer. The DNP DS620A Professional Photo Printer has a maximum resolution of 300 DPI. The printer is capable of accepting roll paper feed. It can print image sizes of 2 x 6″ and 6 x 8″. The DNP DS620A is capable of completing a 4 x 6″ print in 8.3 seconds. Two different finishes are possible – matte and glossy. You can use the same roll feed to produce the two effects. There is also an option to add watermark at the back of the photos. Just perfect if you want to promote your services to prospective clients at an event. Ideal, if you are planning to hand out a print of the wedding couple posing with an invitee (or all of them!). Overall this is a nice printer to have at an event, commercial or otherwise. 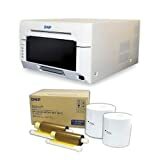 DNP DS620A Dye Sub Professional Photo Printer, Print Sizes: 2 x 6" to 6 x 8"
Print Size: 4"x 6", 5"x 7", 6"x 8"